News.Com: "As Microsoft prepares to launch the first trials of .Net My Services this fall, key details of the plan are still 'not figured out,' said Jim Allchin, Microsoft's group vice president in charge of Windows and server software development. 'I think we just got ahead of ourselves and didn't get clear enough thinking,' he said, echoing similar concerns voiced last August." Must read. 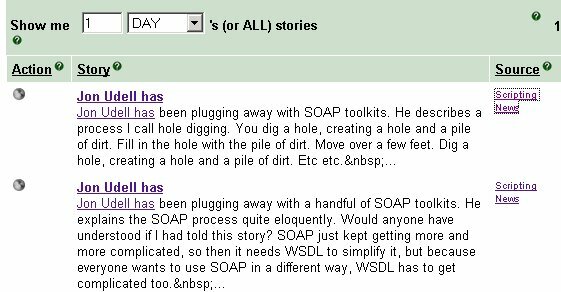 Jon Udell has been plugging away with SOAP toolkits. He describes a process I call hole digging. You dig a hole, creating a hole and a pile of dirt. Fill in the hole with the pile of dirt. Move over a few feet. Dig a hole, creating a hole and a pile of dirt. Etc etc. Jon discovers an important feature of Internet 3.0. Real-time edits preserved for perpetuity. BTW, for everyone who's afraid to look bad on the Internet, I recommend Dogma 2000, the cure for all ills. "The words in your brain are not written in a correct way." Amen! Meryl Evans: "The CSS test files help you destruct a Web site, whether it be for finding leftover font tags or for seeing how a Web site has been constructed." Fox News has a weblog. Jim Roepcke is grappling with a conceptual issue relating to upstreaming. Paul Andrews: "The land of blogs is really the best and brightest Britney-free zone you can find." Lots of cats. I just did some digging and came across a very interesting number. One of our Frontier servers has taken over 37 million hits. The Radio community server, a relatively new machine, also running Frontier, has taken 11 million. Here's a site that, more or less, conforms to Dogma 2000. It's very nice, colorful, pictures of NY's ChinaTown. Lots of little imperfections, make it that much more genuine. Meanwhile Be has become a lawsuit. Rob Fahrni asks why they don't sue Apple. Good question. Slashdot says "Today Be employs a single person in a tiny office in Mtn View." A dispassionate tutorial on CSS from Apple, nicely done. Mindpixel: "New research by economists at the Universities of Warwick and Oxford in the UK has provided surprising insight into just how much people hate a winner." On this day last year: Internet 3.0. "First we need easy-to-program financial services available through SOAP and XML-RPC. A bank implemented in software." Surprisingly as far as we can tell, none of this has deployed, a year later, after all the hooplah about Web Services, esp as it relates to financial transactions. If it had, we'd be able to get an XML-RPC call back from Digital River when a user pays for a new feature or tool, and automatically enable corresponding services on the Radio community server. Without this, we're limited in how we can grow our business, and in the money-making opportunities we can offer to Radio developers and designers. We are not, and do not want to become, a bank. We made a bet, we built an egg, hoping a rooster would have come along by now. Any roosters out there? Limited Pie is a weblog on markets, the economy, and trading. Nice pic of Alan Greenspan in dress with pie. Jumpgate Alwin goes CSS. Nice! 12:03PM: SH4 outage cleared. No data loss. Praise Murphy! 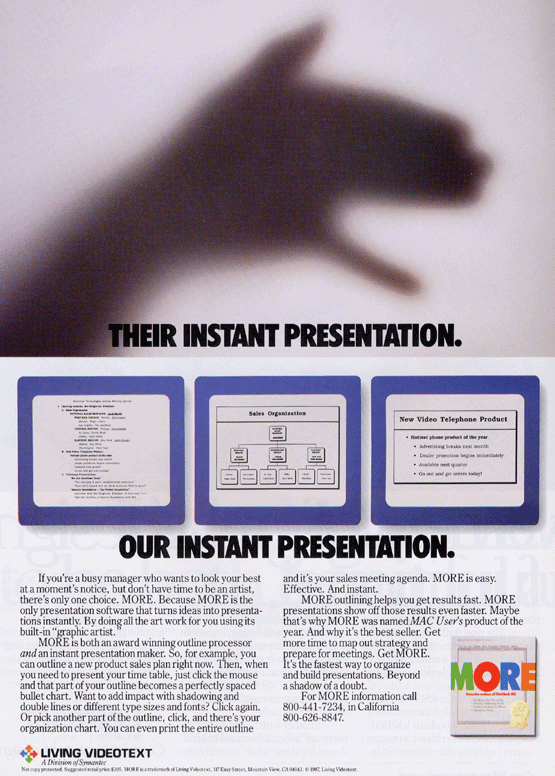 Greg Hanek dug up this old MORE ad from MacWorld 1987. Nice lookin redesign over at Evhead. Blogging about blogging about blogging about blogging about blogs. This reminds me of the watching them watching us watching them watching us stuff we were doing in 2000. Pet peeve of the day. Someone sends an email saying you have a bad attitude because you never respond to emails. So I respond saying something pithy and original, and it bounces, and then I remember it did that the last time I responded to his complaint, and the time before that too. Andy Sylvester updates his Radio UserLand directory. Farhad Manjoo, the author of yesterday's Wired News piece about weblogs, responds to my comments about the story. NY Times: "The Pentagon is developing plans to provide news items, possibly even false ones, to foreign media organizations as part of a new effort to influence public sentiment and policy makers in both friendly and unfriendly countries, military officials said." Yahoo is running a survey for people who use YahooGroups, like me. They must be getting pounded, the response of the survey is very slow. Basic feedback, I don't care about winning $1000. I only care about messages and archives, we never use files, chat, polls, photo galleries, etc. We use their service to tie together communities of developers working on apps and standards, and to support our customers. We chose YahooGroups (when it was eGroups) because their service was so fast and easy to set up. Yes, I would like to get rid of the ads, esp on archive pages, because they interfere with the readability of the pages. But most important I'd like to get more bandwidth. The service used to be very fast. Now it's very slow. I'd pay to get more hardware on their end so they could serve us more quickly. I got a few emails from people who believe that I had not completely obscured the identity of the person at Google who sent me the email yesterday. I understand the confusion, but I did not reveal the person's name. Lawrence Lee, who received the email on our webmaster account, forwarded the email to me. Lawrence works at UserLand, not Google. BTW, yesterday I had a talk with my team, showing them the Google email. I said, if we're lucky someday we will grow large enough to employ people like this. We must make sure that when that happens, we remain accessible to people outside the company, so we can continue to grow. We have an outage on one of our servers, 64.75.32.135, also known as Subhonker4 or SH4. It's mostly used for hosting free Manila sites. One of its databases is damaged, an important one. Another set of other problems keep us from being able to access the backup, so we don't know if the backup is good. We've put in a lot of hours trying to get it back up, but it's clear it's going to take a bunch more. As far as we know, the content of the websites is not at risk. The problem is with config.root, which tells Frontier, among other things, how to map domains to websites. Last update: Tuesday, February 19, 2002 at 9:49 PM Eastern.